Property 8: Warm and Cosy Studio. A stone's throw from the beach. Property 11: Welcome Glen Mountain Gem: Tranquility in the Deep South. One of best base camp areas for anyone. Good, safe area with stunning views. Apartment is well laid out, clean and tidy. On street parking is well lit and secure with 24hr security patrols. Unlimited broadband was also a big bonus for us. Great beach. Uber covers the area very well. Plenty of dining options in the area. All in all, exactly what we hoped for. Many thanks to Mark and Sarah. Wow! Photos do not do this lovely garden apartment justice. 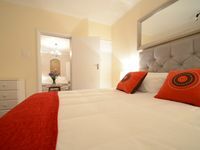 Two very spacious bedrooms and well-appointed bathrooms and a tidy kitchen with all you need for a holiday at the beach. There is one guest parking space available which we found TRULY invaluable at this bustling (in December/January) beachside town where street parking is nearly impossible (and often treacherous bc of steep inclines). The flat was spotless and the addition of nearly daily maid service and laundry made for an extra luxurious treat. The owners Tony and Bibi could not have been more warm, welcoming and accommodating-from staying up until 1am to let us in on our first night arrival after 32 hours of travel (and ensuring we had all the supplies for fresh tea/coffee in the morning including fresh milk!!) to making excellent restaurant recommendations and being flexible when our travel plans changed a bit last minute. Not to mention their darling Pomeranian that captured my daughter&rsquo;s heart (not to worry, the flat is pet free-the cute pup lives in the main house). Felt very safe. Within an easy walk downhill to great beaches and to the tiny town of Kalk Bay which features lovely little shops and ice cream and fish and chips. Easy drive into Capetown proper and all the other tourist sites. Really first rate all around and could not recommend more highly.